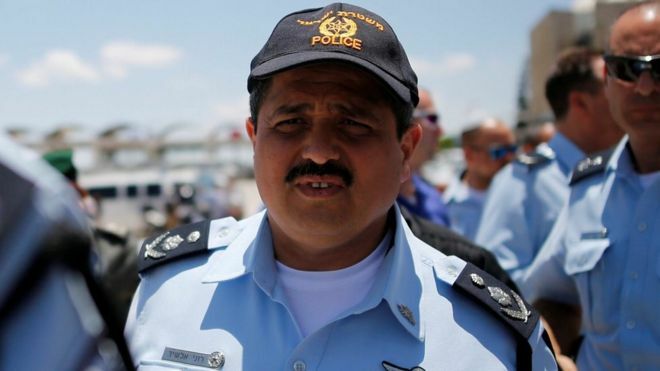 Image captionThe Israel Association for Ethiopian Jews said Roni Alsheich's remarks were "intolerable"
Israel's police commissioner has been criticised for suggesting it is natural to suspect Israelis of Ethiopian descent of crimes more than others. "Ethiopian Jews are Israeli Jews in every way," said Roni Alsheich when asked to address allegations of police violence and racism against them. But, he added, "studies the world over... have shown that immigrants are invariably more involved in crime". Mr Alsheich nevertheless stressed that he was working to curb "over-policing". Members of Israel's Ethiopian community, who account for about 130,000 of the country's eight million population, called for the commissioner to be sacked. Last year, thousands took to the streets to protest against alleged police abuses after a video emerged showing two officers beating an Ethiopian-Israeli soldier. At a meeting of the Israel Bar Association in Tel Aviv on Tuesday, Mr Alsheich was asked why Ethiopian-Israelis appeared to be singled out by his force. "Studies the world over, without exception, have shown that immigrants are invariably more involved in crime than others, and this should not come as a surprise," he responded. Research had also shown that young people in general were more involved in crime and that "when the two come together, there's a situation in which a given community is more involved than others in crime, statistically speaking", he added. The commissioner said this had been the case "in all the waves of immigration" to Israel, and "also with regard to [Israeli] Arabs or [Palestinians in] East Jerusalem". "When a police officer comes across a suspicious person, his brain suspects him more than if he were someone else. It's natural," he continued. "We know this. We have started to deal with this." 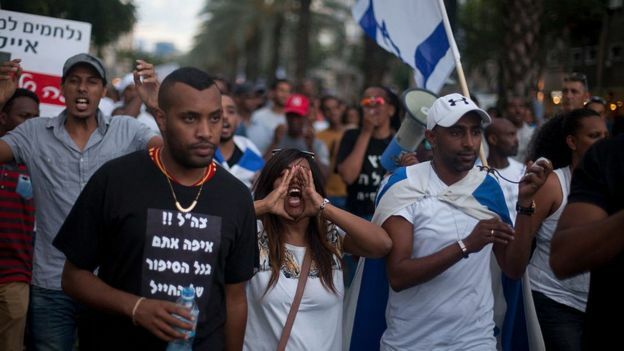 The Israel Association for Ethiopian Jews said the remarks were "intolerable" and reinforced "stereotypes that portray all young people from our community as delinquents and criminals". The legal advocacy group Tebeka accused Mr Alsheich of "in effect declaring that the whole community was a community of criminals" and giving "justification to the police for their systemic racism and violence toward Ethiopian-Israelis". "We are not migrant workers, we are Jews who returned to their country after some 2,500 years in exile," Gadi Yibarkan, an activist who was involved in last year's protests, told the Times of Israel. He added that the commissioner had made it seem "understandable that police officers deal violently with black people and Arabs". 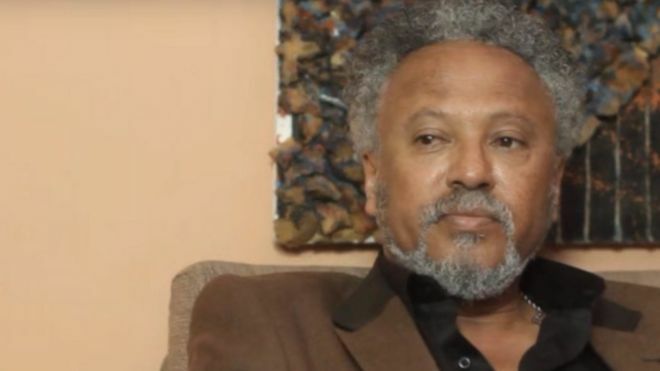 Following the criticism, the police force issued a statement saying that Mr Alsheikh "had no intention of offending Israelis of Ethiopian origin". It added: "The remarks were said, openly, with the intention of correcting and improving [the force]."